23/32in. (18mm) overlay, 2-3/4in. (70mm), non self-closing, five knuckle hinge. 270° opening ideal for armoire or television cabinets. For use with 13/16in. (21mm) thick door and 3/4in. (19mm) panel. Adjustable screw holes. 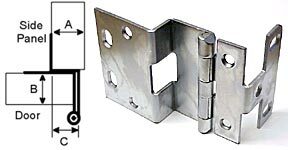 Steel construction (.095in. thick), finished in satin chrome with hospital tips. Designed for 32mm hole system.